RALEIGH, NC (WTVD) -- The distinct Art Deco style clearly defines the WPTF radio station as a 1940's classic. With rounded windows and curved edges, the building looks tiny on the outside, but cuts deep underground into a shelter that allowed announcers to broadcast through wars and hurricanes. Today, it's hidden behind tall shrubs, a chain-link fence, and a set of train tracks - it often goes unnoticed, a relic from a long past era of Raleigh history. Decades ago, this station was staffed 24-hours a day, which means it provides amenities like a kitchen and shower. However, this enticing building has been closed to the public, mostly forgotten, for decades. Nearly 80 years old and sealed to most of the outside world, it harbors dust-coated secrets that time forgot, like a living time capsule. Alongside Director of Engineering Allen Sherrill and QDR disc jockey Jimmy Lloyd, I was allowed a peek inside this living time capsule. Sherrill explains, "Oh yeah, back in the 1950's we had nighttime shows, and at least one engineer had to be out here at all times. Disc jockeys might sleep over, and the building has a bedroom for them. Downstairs, we have a bathroom, and there's even a bomb shelter in the basement." Dusty amps, soundboards, and equipment date back to another era. Yellowed paper with scripts and set instructions are scattered about in a small office where the radio announcer once sat, encircled by glass. I stepped into the room with the 360-degree view, approaching the soundboard. I tried to imagine what it might be like to live in this building, producing live shows 24 hours a day during the Golden Age of Radio. Had Raleigh-area radio stars like Jimmy Capps, Bill Jackson, Bob Farrington, or Wally Ausley touched this very board? "Jimmy Capps," shares Don Curtis, CEO and Chairman of Curtis Media Group, "hosted a show called Our Best to You. He had the highest radio audience of any Raleigh personality ever. And he was the first form of social media." "Back then," adds Paul Michels, Director of Group Operations & IT, "We didn't use telephones as much, you see. We sent letters. So you'd send a postcard to the radio show and say, 'Please play Earth Angel for Suzy Peterson at Peace College, from a Boy at Carolina University.'" "Then you'd wait for the song to be played, and hope you didn't break up before the radio disc jockey got your postcard," laughs Michels. Curtis himself is interested in North Carolina history and, of course, radio. A collection of unique vintage radios decorates his office. He has 2100 radios--some look like classic Coca-Cola cans, Raggedy Ann, 1980's Pizza Hut and My Little Pony, and even Gumby and Mr. Peanut. When asked what sparked his interest in radio, he grins and answers, "I wanted to be a disc jockey. I was in high school and I thought it would make girls like me. I started out applying for a weekend job, and it was filled. But the manager offered to let me sell ads, and I was really good at it." With his passion for vintage radios and North Carolina history, and an enormous collection of classic radio equipment stored in the WPTF building, I asked if he'd ever considered opening a museum. "Oh," he says, "I've dreamed of it. I'd love to do that. But work keeps me busy, so there are no plans right now." While employees and disc jockeys no longer roam its halls, the WPTF building is still a very active site. "The main daytime tower is out there. At night, WPTF is directional, it has to protect some other stations on the same frequency, so the two smaller towers are used at night," shares Michels. "But back in the 50's, it was staffed round the clock. The department had 15 people." The kitchen is a retro-collector's dream. I found a faded McDonald's cup that looks straight out of the 70's or 80's. The cabinets are still stocked with untouched dishes, as if waiting for DJs and engineers to come eat there once again. Old equipment spills out over shelves and fills overflowing boxes - who knows what classic radio treasures might be found inside? "Want to go see the bomb shelter?" asks Sherrill. Dusty metal stairs curl in a steep spiral as we head into a deep basement that Michels describes as a "Frankenstein Laboratory." Enormous metal doors with a huge bar locking them into place tower at least three times the size of a regular doorway. "There's where we used to load in all the massive equipment required to make this place run." He opens the doors, revealing a dark concrete room with no doors or windows. Instead, there's a rusted metal ladder attached to the wall, and a ceiling that opens to the outside world. "We'd lower the equipment in here, then pull it into the basement," Sherrill gestures. Beside the doors sits an old-timey fire extinguisher. Faded brick-red and metal, it dwarves modern-day extinguishers, appearing instead like a miniature cannon, propped up on a rusted metal contraption with wide-spoke wheels. Finally, we approach a small room in the corner. "This is the bomb shelter," says Sherrill. The WPTF shelter, built before the Cold War, was not originally built for nuclear attack. Curtis explains, "The main WQDR site in Auburn actually has a true fallout shelter. The basement of WPTF is more like a disaster shelter, but I guess it could have been used for bombs, too." "The reason we build shelters into our transmitter sites is so, in case of an emergency or nuclear attack, the radio could still keep people, who are trapped in their houses, up to date on the latest news. In a city-wide emergency, we'd want to keep lines of communication open," shares Sherrill. The shelter is stocked with turntables from the 1950's and a couple of old-timey albums: Coffee Break by Reg Owen and Canadian Sunset by Eddie Heywood. Sherrill laughs, "If the world was ending and Raleigh citizens were all trapped in their houses, you'd be listening to this music a lot. Hope you like it!" There's also a well-preserved First Aid pamphlet, printed in 1960. As we head back out, I linger a moment to look at a vintage WPTF sign and a black-and-white photo of the basement when it was decades younger. Men in dated clothes are setting up some of the original equipment. One photo is marked "Andrew 'Andy' Massey, WPTF's First Chief Engineer, 1928-1935." 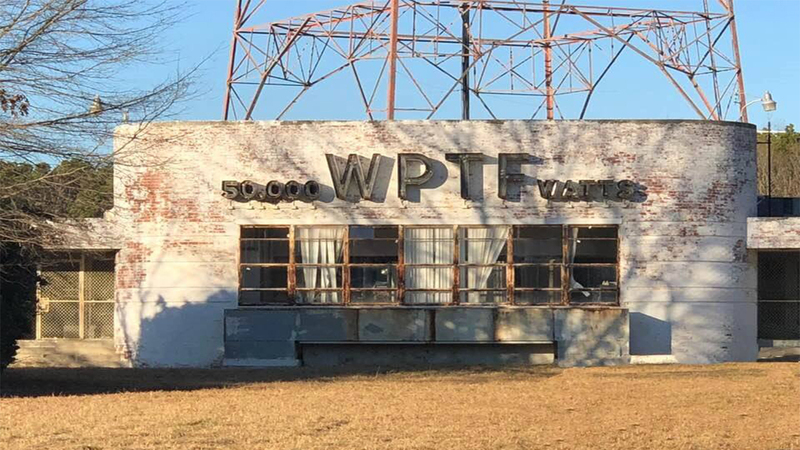 With completely unmarred photos, pamphlets, and equipment dating back to the 1930's and 40's, it makes one wonder how long it's been since anyone's really touched the WPTF building. "Engineers come out here all the time to check the equipment," says Sherrill. But other than that, the building seems to have been undisturbed -- making it a perfect time capsule for Raleigh radio history."